PHOENIX —The Arizona Game and Fish Department will auction its annual collection of wildlife assets March 25-26 during the 2017 Outdoor Expo at the Ben Avery Shooting Facility, just west of Interstate 17 on Carefree Highway. Admission and parking are free. 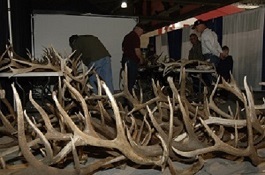 More than 100 sets of antlers, hides, skulls and head mounts, as well as wildlife artwork and taxidermy – all seized during law enforcement investigations, obtained from animals killed in vehicle collisions, or acquired through donations — will be sold. Items can be purchased individually, by the pound or through a silent auction. While a detailed list of assets is unavailable at this time, the department soon will be posting photos on Instagram (www.instagram.com/gf_assets) as examples of some of the individual items that will be auctioned during the two-day sale. Once the expo gets underway, photos of many of the assets will be posted for the benefit of those tracking their bids or wanting to see what items become available throughout the day. All participants must register and obtain a bidding number. All bids must be recorded on the bid sheet that corresponds with the asset. Each bid sheet will identify the minimum starting bid and auction end time. The minimum bid increment is $1. If multiple parties are involved in active bidding at the end of the auction time, the bidding will be closed for all other individuals and the remaining participants will continue placing bids until one person wins. Payment must be received within one hour of the close of the individual item auction. Unless prior arrangements have been made with the auction manager, the successful bidder’s credit card will be charged one hour after the close of the individual auction. All items must be picked up by 4:45 p.m. each day. Payment can be made via cash or Visa or MasterCard. No personal checks will be accepted. All items are sold as-is. All sales are final. All Instagram items can be followed at: www.instagram.com/gf_assets. Online bids will not be accepted. Most of the auction items will be posted on Instagram. The photo will be listed with the start and end time of the auction item and the starting bid. All Instagram posts will be monitored. Any questions posted that relate to a particular item will be answered by staff. Once the individual auction has ended, the winning bidder will be identified and the photo will be deleted from Instagram. Funds generated from the wildlife assets auction are used to purchase equipment and technology used in the investigation of wildlife crimes and to protect the state’s wildlife resources. For the third straight year, the presenting sponsor of this year’s Outdoor Expo is Shikar Safari Club International. Gold sponsors are OneAZ Credit Union and Shooter’s World/Daniel Defense. Silver sponsors are Sportsmen’s Alliance Foundation, Sportsman’s Warehouse, FN Herstal, Cabela’s and Target Factory. For more information about the expo, visit www.azgfd.gov/expo.